The weather has been improving over the last week so I did not expect to see anything unusual on this visit, wrong! Firstly one of the hives that has been a concern over the winter seems to be exhibiting signs of dysentery, the entrance is splattered with excreta and a few more dead bees as shown in the graphic below. If it is dysentery it could be a sign of Nosema, however we will have to wait until it is a bit warmer before taking the required 30 bees for testing. The alternate explanation is that with over 10 days of bad weather the bees were unable to leave the hive and it was still not warm enough to fly when they could so they did their business on the doorstep. The same hive also has a resident below the slab it is situated on, the image shows the entrance. Looks like a rat to me, what do you think? But what was of more concern was the next hive, a full on woodpecker attack with three holes all the way through the side of the brood box. Interestingly this is the only hive attacked and it has patched up signs of previous interest by a woodpecker, is this the location or the woodpecker likes to return to the same box? The colony seemed to be OK and it looks like the woodpecker had only made the holes in the last 24 hours, the series of pictures show the repairs. 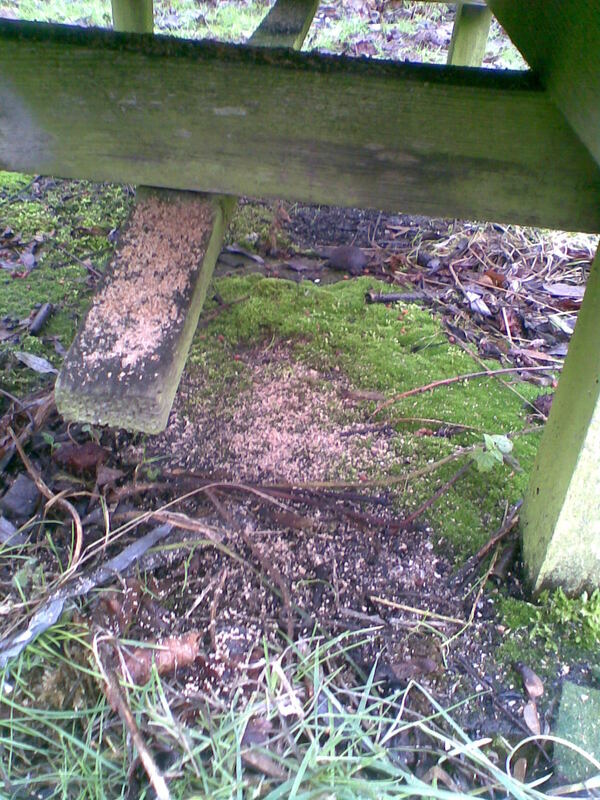 The holes were first plugged, then the sides of the hive boarded over creating a gap between the outer box wall and the outside world, the three none entrance sides were covered in plastic as a deterrent and weather protection, Finally the hive was covered in chicken mesh to prevent the woodpecker if returned being able to reach the woodwork. Let’s hope that is the end of this episode, as a safety precaution over the next week all the other hives will gain their own wire meshing. It has been nearly two weeks since the last visit, with all the snow access and travelling to the Apiary has been a no no. The ground is still frozen just below the surface which means the water from melting snow and rain has nowhere to go, thus forming large icy puddles all along the approach to the Apiary site. All the hives were intact and it was with relief that fresh debris was spotted below each hive, the photo shows the debris below one of the strongest hives. It seems to indicate a large cluster which ties in with the melted frost seen on the 5th January. Even the colony that was fed fondant on 2nd January had some fresh debris which must be good news. The muntjac were nowhere to be seen and there was no trace of them in the area the dog walkers said they lived so maybe they have moved on, let’s hope so. With an air temperature of -5 Celsius it was good to see signs that the colonies in a couple of hives are still strong. The first picture below shows the frost melted on the hive roof, this is due to the heat rising from the colony cluster within. This is a good indication that that the colony is OK, but the converse is not the case. The second picture does not exhibit the same feature, we know that this colony had good stores and was stronger than the other going into the winter so we do not have to be concerned yet. The purpose of today’s visit was to carry out a stock check of all the items in the Association Shed. This was duly completed without too much hassle, although tidying up the spreadsheet so that it makes sense may well be a harder task. It was amazing the amount of through traffic with dog walkers and people from nearby houses showing friends the bees hives over the back field! Previously it had been thought it was just kids that hung around the apiary, but with some of the dogs being very boisterous, thought will be needed on how to manage the foot traffic, particularly during the season. One of the walkers mentioned that a pair of Muntjac deer had made their home next to the apiary, should we be concerned? The number of dead bees at the entrance of hive 4 has not increased although a bee was seen walking out of the hive and falling onto the ground. On further inspection the colony was OK with sufficient stores. Hive 9 was fed with fondant, several strips thinner than bee space laid directly on the frames and below the cover board. 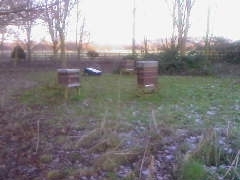 Today’s picture shows three of the hives, note the frost on the ground, it felt much colder than the 4 degrees reported! You are currently browsing the Mid Bucks Beekeepers Association Blog blog archives for January, 2010.